2017 in Pictures – 100 of my favourite photographs from the year. We had a pretty fun and rather busy 2017. We travelled, got engaged, checked off some bucketlist items, witnessed rare events, and rode our mountain bikes a tonne. Photographically, I practised new techniques, acquired some new equipment and expanded my catalogue. The photos below are some of my favourites from the 2017 Calendar year. Hopefully they might bring some joy to others as well. After all, I guess that’s the point… isn’t it? Lukla peers out of the shadows in the kitchen for some thawing xmas left overs. New Years Day in the Sound. 2017 starts here. Strong, cold Northerlies blast snow from the tops of the local mountains. They frequently delivered bitterly cold air from the North. Ice formations on river rocks. Daytime temps were below zero consistently, creating marvelous ice sculptures everywhere. Strong Sunset Alpenglow at it’s peak on Garibaldi mountain. The snow bounces so much light around. The nights were astonishing. Long exposure at high tide. It continued to snow, creating beautiful winterscapes. Lukla sniffs n snorts for salmon remains amongst the rocks under the snow. Wedge Mountain and moon, from a lookout along the Flank trail on Whistler valleys Western side. I must get up there in 2018. 2017 Bald Eagle Count. In a 6km stretch we counted 117 Bald Eagles. A total of 698 were counted throughout the Squamish valley. Not as many as we’d like to see, but better than the last couple of years at least. Ice formations everywhere. Upper Squamish Valley. One sunny weekend we walked across huge sheets of ice, inches thick, that had formed on the Squamish river at high tide. When the tide goes out, the entire shelf is lowered several feet creating large rifts throughout as it settles on the uneven river bottom. Having fun in the sun and the snow. Delightful winter weekends in Squamish, even if we weren’t going anywhere special. Paradise Valley at Sunwolf. This place is already beautiful at any time, but it becomes sublime in the snow. Silent but for the sound of the water and the call of the Eagles. Long exposure during heavy snowfall. The winter alpine experience at the Sea to Sky Gondola was really neat this year, particularly late on Sundays when most visitors are gone. Snowy River. Ha, there’s some quirky nostalgia. Crazy beautiful snowshoes adventures on our local trails. Lukla glinting in the sun. She turned 2 in Feb, now approaching 3. Still a puppy, but also starting to demonstrate adult female behaviours. The Nooksack mists. A ski weekend at Mt Baker was perfectly timed with a large system moving through. I almost forgot to include a photograph from the hill until I saw this one taken of the setting sun through the trees just East of where we were staying down in Glacier. Cellphone panorama of the view from… panorama! wild day in the powder at Mt Baker. Our April escape from Spring rains sent us to Southern Utah for the National Parks. First stop Zion. Wow, The colours and textures along the canyon walls were dazzling. Tara catches a narrow patch of rays for a minute. Deep in a slot canyon on the way up to Observation point high above. Moonrise at Sunset. The pitfall of the timing of this trip was the moon blowing out the night sky all night, every night. We had perfect weather too, only one day that had clouds and ended up quite overcast. The colours and textures continued at Bryce Canyon the next day. The way the light bounced around in this place was breathtaking. The colours jumped out at you, even when shooting into the sun. Layers of time. Future hoodoos begin to appear from the Canyon walls. Bryce Canyon sunrise. This was the one place were the temperatures got quite cold. There was still pockets of snow in the deeper portions of the canyon that saw less sun during the day. Canyonlands National Park. I was really inspired for a great image from here, but this was the one day that the clouds foiled good light at the end of the day. The immense landscapes of this region have to be seen to be believed. Sunrise on Canyonlands National Park. It’s like it’s from another planet. Mesa Arch. A very symbolic location. There were about 2 dozen photographers elbowing each other for position here. I don’t get into that, so I just shot this handheld instead. Cactus in the deserts of southern Canyonlands National Park. The Needles area did not disappoint. The La Sal mountains on the Utah/Colorado border dominated the distant skyline in many scenes. The view from out tent at Monument Valley. Managed front row, nice! It is a busy, paid campground with no sense of solitude, but the view is spectacular. Seemingly a lifetime of anticipation built up before finally visiting and photographing Antelope Canyon in Arizona. A highlight for any visitor, but as someone who appreciates photography, this place was unbelievable, even as I stood there. The theme of the trip continued. Light, colour, shadow, pattern and texture. This natural, completely interactive light show has to be seen to be experienced fully. The photos are cool, but still don’t do it justice. Horseshoe Bend by moonlight. Pre-dawn. I was the only person here when I captured this. When I left, there were hundreds, and 2 drones buzzing around. We returned a bit before lunchtime on the way out of town. It felt like being at a major sporting event there were so many people. Plateau Point at the end of the trail out from the base of the canyon walls. It’s still another vertical mile down to the Colorado river way below. Golden hour. We watched Californian Condors gliding on the thermals as we sat and soaked up the last hour or so of sunlight. The sun sets on the last night of our trip out in natural spaces flooded with geological wonder and mystery. Simply in awe at the Grand Canyon, but also still buzzing from all the incredible places we visited over the last 10 days or so. No Gore Tex required: win!! Back home, and the rains began to ease. Paradise Valley early morning as the Spring temperatures start to kick in with the warm sun returning to the valley. The trails are clear of snow and the dirt is mint. May is prime riding in Squamish. I was remaking this image when this rider came through. Perfect timing! One last snowshoe outing for the season. After a snowy winter, Garibaldi Park was still blanketed in white approaching June. Sunset was timed perfectly for a change and we soaked this up just a couple hundred meters from our destination for the evening. The only two other people up here were sleeping outside. So after we had taken in some of the night sky views, we had the Shelter to ourselves. Tara is not always keen on early sunrises, especially when it’s cold. Sitting alone and just watching it all unfold, sunrise in the mountains is always special. Extra special when it’s your birthday. I thought it was going to be an epic due to the clouds and was getting pretty excited “what a gift!”, but the colours never came. I was disappointed, but still pleased to be here and thankful for the access to such beauty. A different perspective than some of the more common angles of view. Garibaldi is just a picture in the morning light. What an absolute treasure this park is. Just two nights later we drove to Aspen Grove for some truly dark skies. Second from the darkest on the Bortle Scale. Stacked 20 second exposures with a fast, wide lens deliver incredible widefield astrophotos of the milky way. Saturn is also featured here, a bright white dot near the galactic core. The Lupins in May are always a treat with the promising late Spring sunshine. Spent some time on Treasure Trail this year, a Squamish trail network highlight. A progressive year of riding for me, I look forward to riding it more next year. Summer roadtrips. To the Alberta border and back in a weekend. Revelstoke and Golden were very accommodating. I love those lively little mountain towns. Another roadie, this time to the Okanagan Valley. Silverstar Bike Park near Vernon has an excellent trail network with some super fun runs top to bottom. We both had a great day riding together in a bike park, which was a first I think. Tara is really build her skills. Fiery lakeside sunsets in the Okanagan. The 2017 Hot on Your Heels womens Enduro. Tara’s first race! Great day in the forests of Squamish. So good to see so many female riders killing it on the trails. After weeks of dry weather, the forest came to life after a nice soaking the day before the event. Of course this did make the course a little more untrustworthy in some sections. The forest fires burning throughout BC were really making an impact. The worst wildfire season ever recorded caused much devastation. People lost their homes, thousands evacuated, communities choking on thick smoke. We were lucky, the biggest impact on us was that it almost caused us to cancel our trip to Mt Robson, but some favourable winds gave us a window and we took it. Sunset the night before we set off was still indicative of the smoke in the atmosphere. Saturday nights alright. We cooked and ate our dinner here in the valley of a thousand falls, on the approach to Berg Lake. What a spot to sit and read a book with a cup of tea and a brownie after a good day of hiking. The scale of the Berg Glacier is difficult to convey. It tumbles down the mountain over 1,500 vertical meters. Sunset at Mt Robson. We hiked back up here after coming up earlier in the morning to do the Mumm Basin loop. A spectacular spot for a post dinner beverage. No fiery sunset, but still a sensational way to end the day. The stars from our friends Cabin along the Fraser River. The moon was setting quite late so had to fight tiredness to stay up long enough to get a shot. We’d hiked out from our camp at Mt Robson the entire 23km earlier in the day. My legs were toast. The Van took us to wonderful places this summer. I will never get sick of driving this route. Sadly the smoke from the BC fires infiltrated everywhere. Nowhere we went in Alberta was spared from the orange-brown glow. A moment where the smokey colours actually added to the image. Beautiful Meadows along the Icefields Parkway between Jasper and Banff. Golden hour from the parkway. Heavy smoke, but interesting colours. We arrived in Revelstoke to more forest fires and smoke. The drive through Glacier NP along the way included fires burning on the side of the highway. The smoke filled the valleys and made biking a bit nasty on the lungs, so we chilled in the afternoons and looked for new spots along the river. Central Oregon. The night before the much anticipated Solar Eclipse. We camped in the van by the river. The skies were very dark out here, no light pollution. Camping in the van. I can really see the appeal of the “Van Life” movement. Being able to travel when you like, be were you want to be at certain times of day, and then pull up and get some sleep without any fuss is definitely advantageous to a photographer. Probably one of the single greatest highlights of the year, mainly due to it’s rarity. The total Solar Eclipse on August 21st 2017 was a really special moment. I took this image of the cliffs along the river at the the peak of totality. We transitioned from daylight to darkness and back again. Phenomenal. It was a long, hot drive back to BC, but worth every minute of it. Mountain biking the slabs of my backyard. The Beyond the Valleycliffe of the Dolls event is a really fun social ride down some heinous but fun terrain. I nailed a few sections I hadn’t before, so it was a success. Sadly I bowed out of the last stages of the ride after being repeatedly stung by wasps, including a couple on the noggin’! A scenic flight over the Squamish Valley is a great way to show visitors the spectacular scenery and rugged terrain that is all around us here. The rumbling glacier on the Tantalus range shown here just a few days before it’s first snowfall for the season. Squamish. I still have to pinch myself to remind me how lucky I am to have landed here. New Bike Day! Tara’s patience paid off and she found a fantastic bike at a great price from a very friendly and genuine sponsored rider in Whistler. Life changing upgrade. It’s also a very pretty bike so I had to take some pictures of it. Early signs of the coming Autumn as the clouds return to Squamish after a hot, dry summer. The Squamish Estuary is stunning in the silvery light. The Squamish River at high tide. More early Autumn deluxe conditions. Selfie. I was really excited about the coming Fall riding season. After a spectacular year of riding, I was pretty amped to keep it going, and to have a proper go at photographing more of it. Just days after capturing this moment, I had a relatively small incident that left me with an avulsion fracture in my right thumb. The season was done, and I was shattered. Meanwhile, this girl kept at it, riding more and more and even going on numerous night rides well into the Autumn. It’s been really exciting watching her confidence growing and her progress taking her down new trails, or faster down some of her favourites. With a thumb in a splint, holding a camera was a bit challenging, but I wasn’t giving up. The season promised colour and light like no other time of year. Can’t bike, so hiking it is. Scouring the neighbourhood trails for areas that would offer promising images. With lots of sunny days and very little rain, the colours were starting to appear all around us. We don’t get the intense red and orange forests of the East, but the yellows, golds and browns are still highlighted throughout the forest. The rivers were low which wasn’t great for the Salmon waiting to spawn, or for some of the images I was planning. BAM! The first heavy rainfalls came and suddenly the rivers were rushing. It was only temporary however, so this was one of the few days were there was enough water to create the silky effect with an ND filter and long exposures. about 5 days later was peak colour in here, but the river was back to a trickle. The golden arches. Trails for days, I explored and revisited areas around Squamish with Lukla. Weekend walks in the forest. Valleycliffe. If you are in the right areas at the right time, the early minutes of golden hour (just before we lose the sun behind the mountains – sad face) lights up the trees among the steep cliffs above our neighbourhood. Minutes later, it’s all gone. Scouting trees along the Mamquam river, the Golf course is also a beautiful place during Autumn. I walked this pathway many times to access the river in places the sun reaches late in the day…. …. Like this one. Moon for effect. Relatively warm conditions with clear blue skies was just sublime. Autumn also marks the arrival of Bald Eagles from across the continent to feed on the spoils of the Salmon runs. The more time you invest in planning images, the stronger the payoff when you capture them. It can also mean more frustration if you just can’t quite get the image you are trying to create. Here, the trees along the Mamquam River are on fire in the morning sun, but the timing of their peak colours and where the sun rises from behind distant mountains at that time means the light is a little to strong by the time it slides into the valley. Still beautiful though. Mirror-like reflections of beautiful Autumn foliage. The first serious snowfalls on the foothills surrounding Squamish. Some late colours still present in some areas. Mount Garibaldi with a nice crown of semi-lenticular clouds. The Eagles begin arriving in larger numbers. Salmon carcasses litter the river banks, and despite their being plenty of food, who doesn’t like a good squabble? What are you looking at? 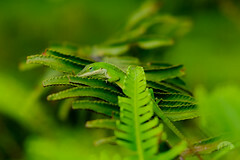 This year is the first where I have had a true telephoto lens to use for Wildlife photography. I’m really enjoying it so far, though there is a strong learning curve. Bald Eagle taking flight from the river bank. Another Eagle snatches a chunk of Salmon carcass and heads for a tree to eat in peace. Lukla loves the beach. The sand under her feet must be a great feeling, she loves to run, play, dig and dive whenever we get the chance. After some heavy rain events and high river flows, major flooding created a new sandbank along the Squamish river to play on. I snuck up on Tara and Lukla to catch the moment in the last photo, and when Lukla finally saw me, she excitedly paddled without hesitation to where I was to show off the ball in her excited tizz. Less enthused to return, she eventually jumped in and paddle back to Tara. Sunny mornings after moisture laden systems move through means amazing clouds, mist and fog as the moisture rises from the valley. The three layers of terrain here are the Smoke bluffs, the Stawamus Chief, and Goat Ridge way up above. Apparently 6 Bald Eagles in a tree is 1 too many. More terrain layers as the fog lifts, revealing the extent of the snowline after last evenings precipitation. Our favourite breakfast spot in Squamish. Fergies Cafe at Sunwolf Cabins. This relatively new addition adds a comfy place to sip a cup of your favourite warmth. A busy location on the weekends, we finally got that coveted spot by the fire on a rainy morning. More mirror-like reflections. Low sun angles as we approach the end of Autumn allows for more interesting images even during mid afternoon. Eagle Watch along the dike overlooking Brackendale Eagles Provincial Park. I really enjoy speaking with visitors, noting the conditions, the wildlife present and of course photographing the Eagles as they go about their day. 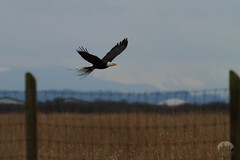 Eagle in Flight with the snow capped mountains of the upper valley in the background. A couple of small gaps in the clouds align to let some late alpen glow onto the snow covered forest canopy. Early Decembers Perigee full moon. 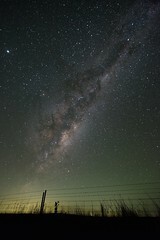 Photographing the night sky is a guilty geek-out of mine. The Perigee or “super moon” is when the moon is closest to the earth at full moon (it’s orbit is elliptical) It appears larger than usual, which may be noticeable with something on the horizon to give reference. There are two more in January (rare) so with some luck we may get to see more very soon. One of the better close ups I have managed so far. This bird was happy to just sit while I watched and waited for interesting poses or behaviour. 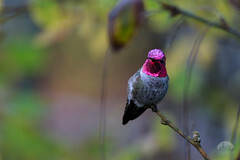 Here, it began preening it’s chest feathers with delicacy and precision using its otherwise dominant and powerful beak. Hanging out in the sloughs hoping for some morsels. Despite the darkness of an overcast morning, modern Image stabilization still allows for sharp images at 400mm. Just before New Years, similar to last year and the year before, the snow fell in large quantities. When the storms cleared the aftermath was something to behold… after shovelling out the driveway. As a part of our trip to the island for Christmas, we stopped in at the Pacific Northwest Raptor Centre in Duncan. The highlight for me was getting up closer to a Bald Eagle than I can with them in the wild. The cherry on top was capturing this beautiful Barred Owl; Wellie, looking right down the lens. Manwe was the star of the flight demonstration. This action shot is arguably my favourite from the day. You can see the Falconry Jesse’s (leather straps attached to his legs) under his feet on the post he is taking off from. A portrait of Manwe. Those eyes. Crescent moon through a gap in the Stawamus Chief. You discover how quickly it actually moves when you have something relative to it’s position as a guide. Late rays of sun light up ridge lines above the lodge at the Sea to Sky Gondola. Goat Ridge looks ominous with a layer of dark clouds in the background. Afternoon sun has Howe Sound aglow as the snow and whispy clouds give a new presence to the landscape. As the sun begins the possibility of memorable lighting begins to increase.